This Is Posts About a New Alternative To Adsense As i Know. Adsense Are You Tired of Applying for Adsense And Got Rejected Every Time. Or Afraid Of Applying Adsense So They Will Reject You And Searching For Best Alternative To Adsense . For Countries Like India, Pakistan etc. That Renders Maximum Earning Chances To Publishers. If Yes You Are on Right Place. 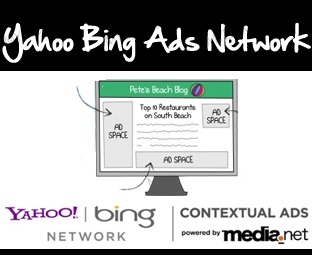 Recently, Yahoo And Bing have Signed a Legal Agreement With Media.net Render Contextual Advertisements To Webmasters Who Are Willing a Sign up To Their Programs. According Yahoo Every Web Publisher Can Enjoy This Service if His/Her Blog Or Website Have a Good Number Of Quality Content And a Decent Number Of Unique viewers. The Advantage Of Signing up With Media.net is They Do Not inspect Blogs Very Deeply Just Like Google Adsense. Yahoo Bing Network is Also Giving Medium Blogs And Bloggers Also. It Will Not look Your Blog Very Deep As Adsense. But You Should Have Atleast Average page views About 300 Daily. As They Are Receiving More And More Invitations They Will Process Invitations Slowly So, You Should have Wait for 2 Weeks After Sending Invitation. And Then You Will Receive a Confirmation Email So Check Your Email Daily AfterApplying. As Started, Yahoo Bing Ads Network is Paying $0.002 for Per Click, That is $1 For 500 Impressions And increase According To Your Pageviews And Impressions. This is Not bad Than Other Networks. You Will Be Get Paid When Your Revenue Reaches $50 ( Minimum ). There Are Four Ways Collect Your Revenue, Including Paypal Option That Will Let You Get Paid More Easily. So What Are You Waiting For Turn Your visitors in To Your Money with Yahoo And Bing Ads Network.